Sagitec HealHub is a health data-ops platform to jump start your digital journey. Sagitec Solutions, a global technology company that designs and delivers IT solutions for the pension and unemployment insurance industry, has expanded into the healthcare and life sciences (HLS) market. KV Subrahmanyam, Ravi Sankar and Lakshminarayan Saravanan, three industry experts will lead this diversification effort. They partnered with Sagitec because of their reliable and scalable platform framework. Sagitec's development suite is a catalyst that they exploited to develop HealHub – a HIPAA compliant, cloud-based data-ops platform for the HLS industry. HealHub offers a digital health stack for organizations to transform their healthcare programs ranging from member engagement, pill+ services, connected health for pharmaceuticals, reducing fraud and waste for health insurers, analyze real world evidence and other value based programs. HealHub has the data infrastructure to convert myriad types of health data into live action and insight for HLS organizations. Digital technologies are clearly seen as a foundation to disrupt and transform the healthcare industry. But healthcare firms, life sciences companies and large employers are overwhelmed with questions on where to start, what to focus on and how to scale their digital transformation journey. HealHub uses Microsoft Azure extensively for machine learning, analytics and business intelligence. In addition to enterprise class security, Azure is also HIPPA compliant to ensure that health data is secure. 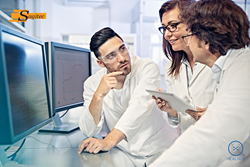 Sagitec HealHub is a great fit for healthcare and life sciences organizations to start their digital journey and even has tremendous potential to help organizations self-administer health benefits. Sagitec also provides application development and maintenance services for HLS organizations and has already started working with clients in this space. HealHub has the ability to integrate with the Internet of Things and cleanse data to provide a holistic view of the data through dynamic visualization. Sagitec Solutions, LLC designs and delivers tailor-made pension, provident fund, unemployment insurance, and healthcare and life sciences software solutions to clients of all sizes. Understanding that a dynamic world requires dynamic technology, Sagitec offers solutions that are highly configurable and extensible by nature. With deep industry experience in software implementation and systems integration, project management, consulting, hosting and software support, Sagitec is a partner clients can trust to deliver mission-critical IT projects. They are headquartered in Saint Paul, Minnesota. Learn more by visiting http://www.Sagitec.com or by contacting Rick Deshler at (651) 335-3406 or at Rick.Deshler(at)Sagitec.com.